Let's look at the market's performance on 15th April, 2019. The top sale of the day was Manipulate.com which sold for $13,500 at JazzDomain.com. NameBio recorded 380 sales $100+ for a total of $182,785 with an average sale price of $481. Compared to the previous day there was an increase of 38% in the number of sales and the total dollar amount increased by 32%. We also recorded an additional 1,109 sales below $100 for a total of $29,550. The domain EzGuard.com sold for $400 at GoDaddy for a decrease of 60%. It last sold for $1,000 on March 7th, 2011 at Sedo. The domain TheIceHouse.com sold for $353 at NameJet for a decrease of 71%. It last sold for $1,225 on April 15th, 2015 at NameJet. The domain OHPR.com sold for $1,000 at DropCatch for a decrease of 82%. It last sold for $5,411 on December 19th, 2007 at Afternic. The domain QuickFactor.com sold for $256 at NameJet for a decrease of 82%. It last sold for $1,395 on February 4th, 2015 at Sedo. 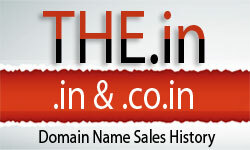 The domain RecruitingAgencies.com sold for $128 at GoDaddy for a decrease of 89%. It last sold for $1,200 on November 4th, 2012 at Afternic.